THE STORY - A young Englishman (Sam Claflin) seeks revenge against his beautiful cousin (Rachel Weisz), but soon finds himself falling under the spell of her mysterious charm. THE GOOD - Rachel Weisz will always keep you guessing. The film's themes will inspire some lively discussions afterwards. THE BAD - Roger Mitchell does not give the film the right aesthetics to truly make it resonate beyond the performances and themes. Sam Claflin's character will irk many. “My Cousin Rachel” is a handsomely mounted period piece with a dynamite central performance by Rachel Weisz as the titular character. However, the other lead performance by Sam Claflin and his character’s behavior throughout, keep “My Cousin Rachel” from being anything truly special. Those hoping for writer/director Roger Michell to take a firm stance on the film’s gender politics may be left disappointed as the film presents both sides rather ambiguously. It forces the audience to place their own beliefs onto the film’s characters and plot, which as stated, I’m sure will make for one hell of a discussion afterwards despite it not allowing the film to fully commit itself towards one belief or not. 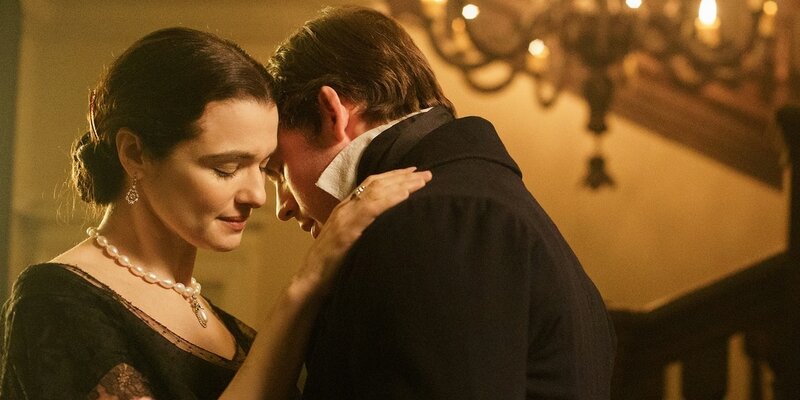 Taking place during the 1800’s in England, “My Cousin Rachel” follows Mr. Philip Ashley (Sam Claflin), who before his 25th birthday unexpectedly comes to learn that his adoptive father has passed away due to a brain tumor. However, suspicious letters sent by his uncle to his estate suggest that his wife and Philip's cousin Rachel (Rachel Weisz) may have had something to do with his death. Eager to confront her, Philip is taken aback by Rachel’s beauty and he starts to become infatuated with her leading to a dark and foolish path that will change the two cousins forever. Rachel Weisz is an actress I continue to admire as the years go on and Hollywood starts to utilize her more properly. She is truly let loose here in an unclear performance that keeps the audience on edge throughout, always guessing and constantly engaged. If anything, she is the reason to see “My Cousin Rachel.” By the time the film reaches its final moments, I was still left unsure as to the true motivations of the Rachel character and a lot of that credit has to go towards Weisz. Claflin has the more thankless role, as we always know what his intentions are (And they’re quite despicable and pathetic). However, once again, by the time the film is over, we are left with a cold sense of unease and confusion, for we are not sure if Claflin's Philip was of sound mind throughout the final two-thirds of the film. Despite his character being a whiny, annoying and downright terrible human being, we are still forced to ask questions at the end and that is what makes “My Cousin Rachel” so rich. Who is to blame for the devastating effects of this infatuation? “My Cousin Rachel” does not give easy answers and that’s a good thing. Roger Michell gives “My Cousin Rachel” some pretty cinematography that could have done with a more intense and darker gothic look. The film is lush throughout, with vibrant green fields and brightly lit interiors (Including the darker scenes at night) which does not help the film’s mood or message. It may look good but something about it always feels off in terms of tone. The film’s editing is also questionable as it can be a bit choppy throughout leading to a distracting sense of pacing despite the below two-hour running time. “My Cousin Rachel” is not so much a great thriller, nor is it a terrific costume drama but I’m sure it will inspire many essays and discussions on the thoughts, interpretations, and beliefs between the relationships of men and women. It’s not a perfect movie by any means but with a compelling lead turn from Rachel Weisz, it manages to stick together leading to a haunting and thematically rich finale that will have audiences talking about the film’s themes for days.